Thousands joined us for this powerful weekend of action. Last weekend, thousands joined us for a powerful series of actions to break free from fossil fuels: we had hundreds of people at the blockade of train tracks leading to the Pacific Northwest's biggest source of unmitigated carbon pollution, 2,000 at the Indigenous Day of Action on land and water, and nearly 1,000 at the People's Climate Conference. Huzzah! Click here to watch an inspiring video about Break Free PNW! Check out the wrap-up video, and find more beautiful photographs of last weekend's actions here. It's always impossible to say exactly what comes of any given event, and this is a long struggle. The two refineries in Anacortes, WA that Break Free PNW took on -- like most refineries throughout the world -- are likely to continue pumping out pollutants for years. 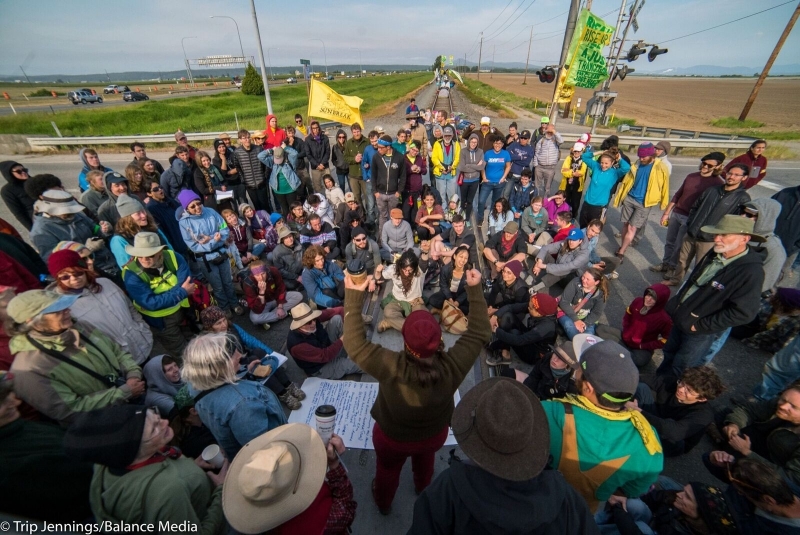 But in Anacortes and throughout the region, we helped to "move the center" considerably -- so that grandmothers, tribal members, and refinery workers alike were talking about the necessity of a just transition to a clean energy economy. This was truly an incredible collaboration, and has made our movement bigger, stronger, and broader. If you are ready to keep fighting oil trains, you can get involved in the Stop Oil Trains Week of Action. Between July 6th & 12th, we'll demonstrate the power of our movement with 100 events across the US and Canada to #StopOilTrains and show that clean, safe energy is 100% possible right now. Join an event, or plan your own -- details here. Thank you for your support. This is the fight of our time, and we need all of you. P.S. 52 people were arrested last weekend -- can you contribute to the Break Free PNW Legal Support fund?